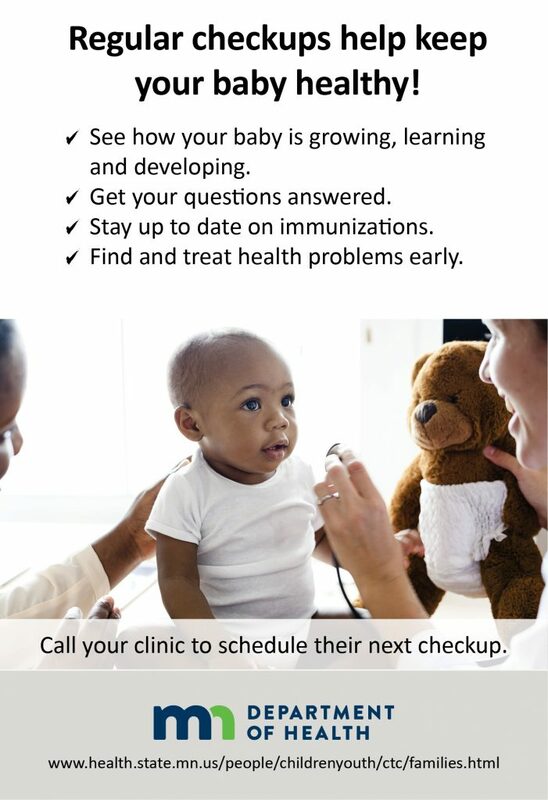 Regular checkups for your baby helps keep them healthy. These well child checks are recommended every 2-3 months from birth through about 2 1/2 years old. After that, your child should get a checkup once a year. At these appointments, the medical provider will make sure your baby is growing, learning, and developing. They do this by checking for developmental milestones. Developmental milestones are skills your child learns such as taking their first step, smiling, waving, and pointing. At the checkup, the medical provider will learn more from you about what your baby is already doing, and they look at things like how your baby moves their body, interacts with others, explores and solves problems, and communicates. Checking for developmental milestones early in a child’s life is important because it can help you and the medical provider identify any concerns early. If your child is not meeting certain milestones when they should, there are often things you can do to help get them back on track. Your child’s medical provider will either work with you or help you find the right resources for your child. You can learn more about developmental milestones at www.HelpMeGrowMN.org. This website will give you information on what you can look for and help you prepare for your baby’s next checkup.